The Cowboy charcoal story dates back over 100 years, starting in Southern Ohio when Jess Rollins went from farmer to farmer, burning their cleared trees into charcoal that could be resold. Then in the 1930's, Roland Crace brought some manufacturing into the business by moving the onsite charcoal burning into centralized kilns. In the 1950's, operators of the West Virginia charcoal plant, Don and Joe Crace, expanded the business under the name Pioneer Charcoal. The two also created Hickory Specialties in the 1970's to initially market their liquid smoke product, but later shifted that brand into the briquettes business. That business was sold to Bob Evans Farms in 1992, and in the same year, Don Jr. and Sam Crace started the Cowboy Charcoal brand, shifting the focus primarily to the production of lump charcoal. Today Cowboy Charcoal is a subsidiary of Duraflame, and along with continuing to churn out lump charcoal, they also sell briquettes, woods chips, and recently added three varieties of barbecue sauce to their expanding product inventory. A bowl of molasses greets your nose on first whiff of this sauce. That deep sweet aroma is backed by a hearty, non-sweet tomato that brings to mind the smell of tomato paste. There's also a smoky and earthy quality giving the sauce a more prominent barbecue stamp. Worcestershire is also clearly present, but plays more of a background roll, along with the heat from peppers, which get overtaken by the overpowering sweet molasses. This dark maroon sauce is semi-glossy with the sightless texture to it. It's opaque, making it hard to see any spices at all. It's medium-thick consistancy has the sauce falling in one large glob at first off of a suspended spoon, followed by quick drips. The final couple of drips release very slowly, and when all is said and done, a medium coating of sauce is left clinging to the silverware. An upfront syrupy sweetness gains balance with a heavy acidic tomato in the initial taste of this sauce. Molasses comes in quickly as well, giving the sweetness a depth of flavor. As the sauce settles on the tongue, complex Worcestershire begins to play prominently right before the sauce turns more tart by a strong vinegar tang. 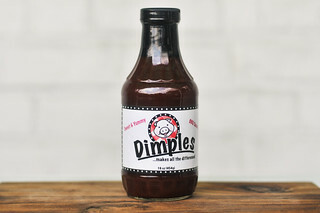 That tartness amplifies as the sauce turns spicier and spicier, ending with a tangy, tongue tingling heat that retains a more mellow molasses component. The sauce coated the chicken in a medium, uneven layer that baked down well over indirect heat. When move right over the fire, the sauce picked up some caramelization and suffered just a little burn off. The flavor retained its robust tomato and molasses profile. The first few bites were primarily sweet, but the peppers started to then kick in and introduced a heat that balanced with the sugars. There was also a nice tang in there as well, which, when combined with the spiciness, left the lips a little tingly. 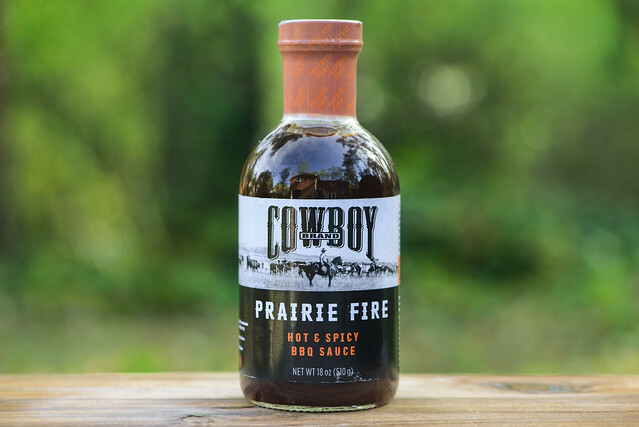 The initial taste of Cowboy Prairie Fire has the makings of the type of bold, in your face flavors of many standard supermarket barbecue sauces—it hits the tomato, molasses, and sugar hard. 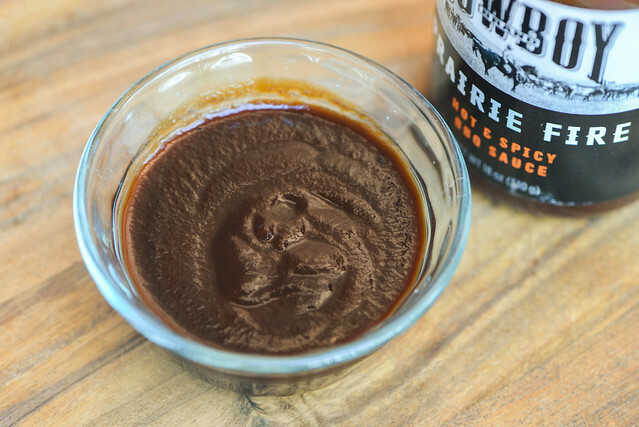 But after a couple more spoonfuls, you can taste way more craft, and way less processed flavor than the norm, which raises this sauce in the overall ranks. while coming out of the gate with a big and bold profile, the ingredients all taste fresh and clean, and there's a underlaying complexity from Worcestershire and a nice progression of flavors ranging from sweet to tart to spicy that makes the sauce unique from common rivals. Still, it treads familiar ground, albeit in better fashion, with a strong flavor that's well suited for beef, chicken wings, pork, and ribs. While its intensity can be an asset, it could also be a fault by overpowering some more lightly flavored items like pulled pork, grilled chicken, fish, or veggies. Meatwavers can give an extra big thanks to Cowboy Charcoal for overloading the Meatwave with their sauce, meaning we have more than normal to giveaway. So with your chances good on winning, all you have to do to enter to win one of two bottles is to comment on this post with the barbecue restaurant, city, or state you most want to visit Deadline for entries is 11:59pm on Tuesday May 23, 2017. Read the official rules for more details. One entry only per individual. Good luck! Being a native North Carolinean, I'm ashamed to say I've never been to Skylight Inn in Ayden, NC. I made the trek out last December, but they ended up being closed. Joe's Kansas City BBQ, the original, in the gas station. I haven't had a chance to try Q39 in Kansas City yet. I haven't ever had Texas bbq. I would like to try that! Stubby's & McClard's in Hot Springs! Sooo good! I have been wanting to go to Atomic Grill in Morgantown, West Virginia!! I hear it is the best BBQ around my state!! I'd love to try any Texas B-B-Q Restaurant. I only hear many good things about Texas Restaurants, so someday I'll have to venture out that way, and try a few out. I have heard so many wonderful reviews on a place in the middle of WV called THE GRILL. I so want to go. I forgot to pick my restaurant which would be Wiser's Choice in Laceyville, PA. 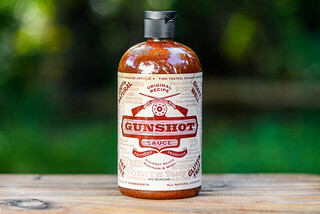 I would love to try this sauce! I'd like to try any TX BBQ restaurant! Like to eat at the Rendezvous in Memphis, TN. I want to try Q39 in Kansas City! I would like to try some in Memphis! I want to try Central BBQ in Memphis, TN!! I have heard great things about it!! Would love to get to Texas for what I hear is some of the best BBQ! I want to visit Memphis, TN. I have heard there are some of the best BBQ joints in the world there...and I need proof! I seen them on the food channels and thing Memphis, RB should be very tasty. I would love to visit Memphis and check out all of the delicious bbq they serve there. 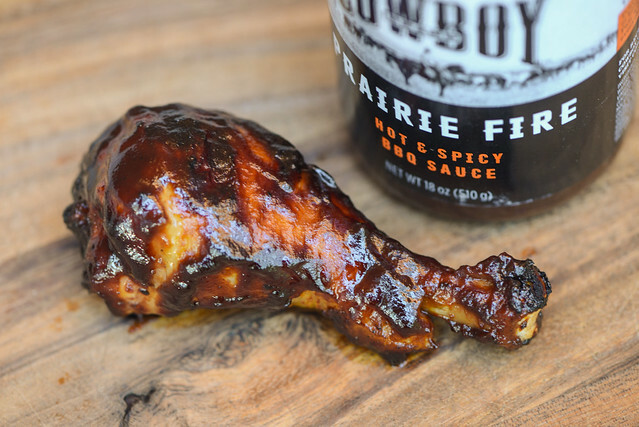 I've heard nothing but good things about Cowboy Charcoal BBQ Sauce & Prairie Fire sounds amazing!!! I would love to dine at Kerlin BBQ in Austin, Texas!!!! I would love to visit central bbq in memphis tn! I want some real kansas city bbq! Franklin in Austin, of course. I'd love to head to deep south Louisiana, and have some real cajun BBQ. I think spicy foods are right for summer. The BBQ Barn in my home town. Would love to stop in at the Memphis, TN Central BBQ. Probably try several in Memphis.